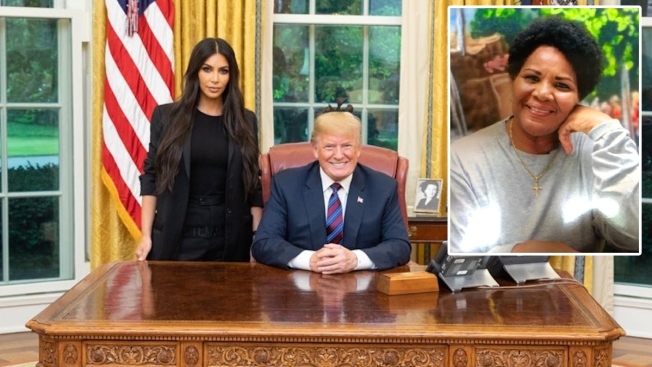 This Wednesday, May 31, 2018, photo released by President Donald Trump shows him with reality TV star Kim Kardashian West in the Oval Office, where she advocated for Trump to reduce the life sentence of Alice Marie Johnson (inset), who has served more than two decades behind bars on drug offenses. An inmate whose life sentence was commuted thanks in part to the efforts of Kim Kardashian West has a book deal, along with deals for film and television rights. Harper, an imprint of HarperCollins Publishers, announced Wednesday that Alice Marie Johnson's "After Life: My Journey From Incarceration to Freedom" comes out May 21. Kardashian West contributed a foreword to what Harper is calling an "honest, faith-driven memoir" and a "deep look into the systemic issue of mass incarceration." Film, television and "life rights" were sold to Endeavor Content and One Community. "I feel humbled that the telling of my story gives hope and my years of pain were not in vain," Johnson said in a statement. "My life has forever changed because of Alice Marie Johnson," Kardashian West said in statement. "Her story is a gift that will now reach so many millions more through her book and film. I hope Alice's case is just the beginning of a movement to help those left behind. I am invested in continuing to support Alice and this cause." Johnson, 63, served more than two decades of a life sentence without parole for non-violent offenses before President Donald Trump commuted her sentence last year. Kardashian West personally lobbied him in the Oval Office, a meeting which Trump son-in-law Jared Kushner helped arrange. Last December, Trump signed bipartisan legislation that gives judges more discretion when sentencing some drug offenders and boosts prisoner rehabilitation efforts. On Tuesday night, Johnson was among those invited to sit with first lady Melania Trump and Trump family members at the State of the Union address. "Alice's story underscores the disparities and unfairness that can exist in criminal sentencing — and the need to remedy this total injustice," Trump said during his speech as Johnson, wiping tears from her face, received a standing ovation. "Alice, thank you for reminding us that we always have the power to shape our own destiny."